Color: Black or as your request. Packaging: Wooden or Wooden Iron Drum. Application: Used to supply 3-phase power, usually from a pole-mounted transformer, to the user’s service head where connection to the service entrance cable is made. To be used at voltages of 600 volts phase-to-phase or less and at conductor temperatures not to exceed 75°C for polyethylene insulated conductors or 90°C for crosslinked polyethylene (XLP) insulated conductors. •B-230 Aluminum Wire, 1350-H19 for Electrical Purposes. •B-232 Aluminum Conductors, Concentric-Lay-Stranded, Coated Steel Reinforced (ACSR). •B-399 Concentric-Lay-Stranded, 6201-T81 Aluminum Alloy Conductors. •B-901 Compressed Round Stranded Aluminum Conductors Using Single Input Wire. quadruplex service drop cable meets or exceeds all applicable requirements of ICEA S-76-474 . Please Choose the specification you need，meanwhile, we can customize for you，our competitive price will send you in 12 hours. Product Process: We produce the service drop abc cable use the high quality aluminum material,Every production process has been strictly checked by our professional technical engineers. 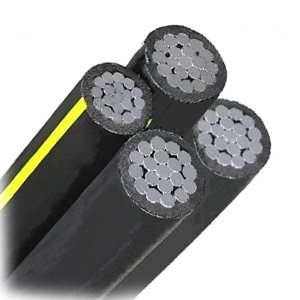 As a professional cable cuadruplex manufacturer, we can provide you the best price, quality and service. Push the button, we will reply with 12 hours. In the cable industry, the storage and transport are two important sections. They are equal important to the quality of cable cuadruplex aluminio. If the ways of storage and transport are improper, it will influence its quality. It also may cause some disasters. So as a professional supply of cable cuadruplex aluminio, Huadong Cable Group put the storage and transport into an equal position with production. In the storage, it can’t contact with acid substances, alkali substances and mineral oil. These corrosive substances should be insulated with the cable cuadruplex aluminio. In the storeroom, there shall be no harmful gas to break the insulation and erode metal. When we store up, we should avoid put them naked in the open place as far as possible. The cable cuadruplex aluminio is not allowed to lay off. During the storage, it should be rolled regularly. In the summer, it needs to be rolled every three months, and deferred in other seasons as appropriate. The rolling should roll the down side of cable cuadruplex aluminio up, in case of the bottom surface gets wet and decay. There is an important point. We should pay attention to the cable head, and check if it is complete. The shelf life of cable cuadruplex aluminio is limited. In general, it is not more than one year and a half, and the longest is not more than two years. Huadong Cable Group adhere the storage requirement, you can come and visit our factory, leave yourmessage, we will send the address to you later. Before shipment every types of cables have been rigorously tested. During transportation, it is forbidden to drop the cable or cable tray with cable cuadruplex aluminio from a height. Especially when the temperature is lower than 5℃, it would contribute to the insulation and sheath cracking. When the crane lifts the package, it is strictly prohibited to hoist several stray at the same time. In the vehicles, ships and other means of transport, the cable tray needs to be fixed in appropriate method, in case of collisions or falling over each other to prevent from mechanical damage of cable cuadruplex aluminio. We have the most professional means of storage and transports, so choose us is your best choice. We have exported wires and cables to more than 30 countries,such as: Russian, America, Yemen, South America, North America, Middle East, Africa, Asia,Oceania countries and etc. Welcome to visit our factory. Leave you message, we will send the address within 12 hours.